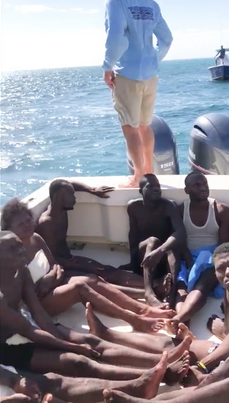 The search for Haitian migrants who were aboard acapsized vesseloff the northern Bahamas remains ongoing, the Royal Bahamas Defense Force said Monday as Bahamian police and immigration continued their investigation into what caused the boat to sink and who is behind the deadly voyage. The Royal Bahamas Defense Force said Monday that no new bodies or survivors had been found, but it revised its official count for the tragedy following a meeting in Abaco between Bahamian immigration and local authorities.. During the meeting, also attended by the Haitian ambassador, it was noted that one of the rescued migrants had to be airlifted to Nassau and was not part of the original tally of 17 survivors and that one of the corpses could not be retrieved because of sharks. Both the landings in the Turks and Caicos, and the Bahamas are among a string of clandestine voyages involving Haitians amid a worsening economic situation in Haiti. But unlike the Turks and Caicos landing, which was also confirmed by the country’s Immigration Minister Sean Astwood, the one in the Bahamas near Abaco turned deadly on Friday when the vessel possibly hit a reef in 40 feet of water. Bahamian immigration has said there may have been as many as 87 Haitians on board the boat, described as a 40-foot conventional sailing yacht. Instead of traveling toward the southern Bahamas island of Inagua and coming through the Exumas to reach Nassau as has been customary, boats are now traveling east on the Atlantic to land in the outer islands of the archipelago, perhaps to avoid detection. In addition to the conventional sailing yachts, the Royal Defense Force is also seeing motorized vehicles along with the traditional wooden Haitian boats known as sloops. The governments of both the Bahamas and the Turks and Caicos have long expressed concerns about the flood of Haitian migrants who continue to seek out their shores. Last year, during a meeting of the 15-member Caribbean Community in Port-au-Prince hosted by Haitian President Jovenel Moïse, Bahamian officials raised the migration issue. Among the ideas raised — and yet to receive any response from Haitian authorities — is a joint maritime agreement that would allow Royal Bahamas Defense Force boats to patrol Haitian waters with Haiti National Police Officers aboard. “We would like to see some kind of comprehensive maritime agreement… with Haiti that would help us to help them prosecute these cases because of the risks that are obviously involved in a case like this, which turned out very badly,” Henfield said. Henfield said while survivors will eventually be repatriated back to Haiti, his understanding is that the Haitian embassy is asking for the bodies once the pathologists and coroner are done.